Defined Benefit vs. 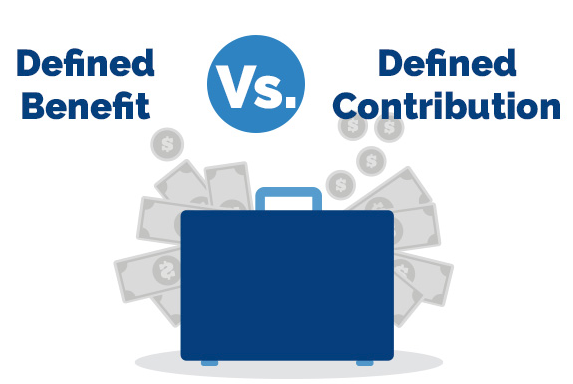 Defined Contribution Plans: Which Adds More Value at Retirement? When choosing a defined retirement plan, a normal desire is contributing the least amount of money and assuming as little risk as possible. Playing it safe is a natural instinct when it comes to money you have worked so hard to earn. What you should ask yourself though is if that safety will ensure your money will last through retirement. There used to be a time when employees stayed at the same job through the span of their career. Employers valued their workers and showed appreciation in the form of hefty pensions. There were no personal investments, fund choices or need to be financially savvy required on the part of workers. In today's work environment, employees must be more involved to meet retirement goals. To start, you should know the difference between defined benefit plans and defined contribution plans. Then you can better understand the retirement plan that you have access to through your employer and make a well-informed decision on how it can benefit you at retirement. Companies control pensions to give employees a set amount of money at retirement. The amount that each employee earns depends on criteria that the employer sets. They could consider factors such as years of service, age, salary or performance. Cash balance plans. A cash balance account is slightly different in that employers add a percentage of your pay to an account. They also determine an interest rate that accrues based on the balance. Employees can either take the balance either at retirement age or roll it over when they leave the company. Those who have limited funds to invest will appreciate defined benefit plans. It's also comforting to employees with limited investment experience or risk tolerance. With this plan, employees reap benefits of their hard work without personal investments or find choices. Funds are also insured by the Pension Benefit Guaranty Corporation (PBGC). The most common defined contribution plans are 401(k)s. With these plans, there are no employer guarantees. Adding money and selecting investment accounts are up to the individual, although employers may choose to contribute. When signing up for the plan, they choose an amount of money to invest each pay period. Like with health insurance, your paycheck will be minus the investment amount. Employees must select from fund options or choose a risk tolerance from conservative, moderate or aggressive. Some employers may also offer a matching contribution, meaning they will add the same amount (or percentage) to the account as you do. For instance, you could add $100 to your 401(k) every pay period. If the company matches 100 percent, they will add an extra $100 to your account. If they only match 10 percent, they will add $10. Some employers may voluntarily add a set amount to the investment account each pay period without requiring your contribution. Defined contribution plans have several advantages to increase retirement income, including pretax investment dollars. Delaying taxes, employer contribution, and aggressive investment options give an opportunity to grow a comfortable retirement over time. However, knowing how much to invest and how much risk to take is challenging. Fortunately, there are resources like our 401(k) advice and management service. Our service gives custom recommendations for how much to invest and where to place the funds to meet retirement goals and can even manage your 401(k) account for you. This advisory service can reduce anxiety by not only giving you a personalized investment allocation recommendation for your defined contribution plan, but we also show you future retirement projections based on how you are saving and investing. This information can help you decide if you need to save more now to be able to live more comfortably in the future. Implementing those strategies and managing your investments gives you peace of mind that experts helped you make the right decisions.